Cravings For Puto Bumbong Satisfied! I am very fond of the Filipino kakanin and have been craving for puto bumbong for ages now. I was disappointed that I was not able to get some during the Christmas season when these are always available in front of local churches, a popular dessert to eat after hearing Christmas masses. I thought I had to wait until December to taste the gooey goodness of this local delicacy, it is a good thing we managed to grab some at Via Mare during our visit to Kidzania in February. It was yummy as expected and I should’ve ordered more for takeaway. Via Mare added an interesting twist to the flavor we’ve grown to love by adding a generous amount of grated cheddar cheese to the purple treat, for only Php15. Aside from the regular cheese, you can also opt for a sprinkle of grated queso de bola as toppings, just add Php23. I absolutely loved it and it is making me crave for some now that I am writing about it! 😀 What is your favorite local kakanin? This entry was posted in comfort food, desserts, foodie adventures and tagged Filipino delicacies on 5.April.2016 by admin. this is the only photo of the food we managed to snap that day. 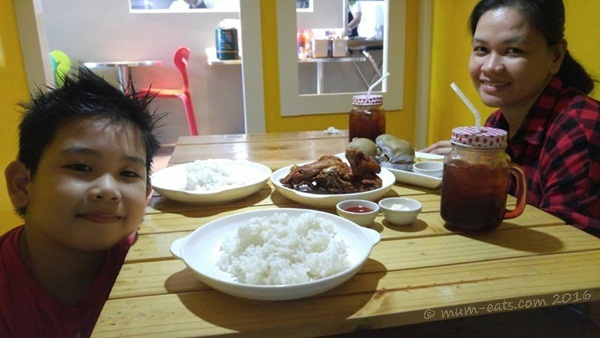 This new resto at Robinsons Place Malolos captivated the little one’s attention the very first time we passed by it. I think he got excited with the unique and colorful set up of the place and associated it with those fun and enjoyable play places for kids that he love to frequent. The place sure does have a very fresh and interesting set up, as instead of just tables and chairs that we normally find in regular restaurants, Little Chalet has little rooms where diners can eat with their family and friends in privacy. Each room also come in beautiful colors that are such an eye candy to little kids. This entry was posted in foodie adventures and tagged dining out, Malolos food crawl, restaurants on 1.April.2016 by admin.